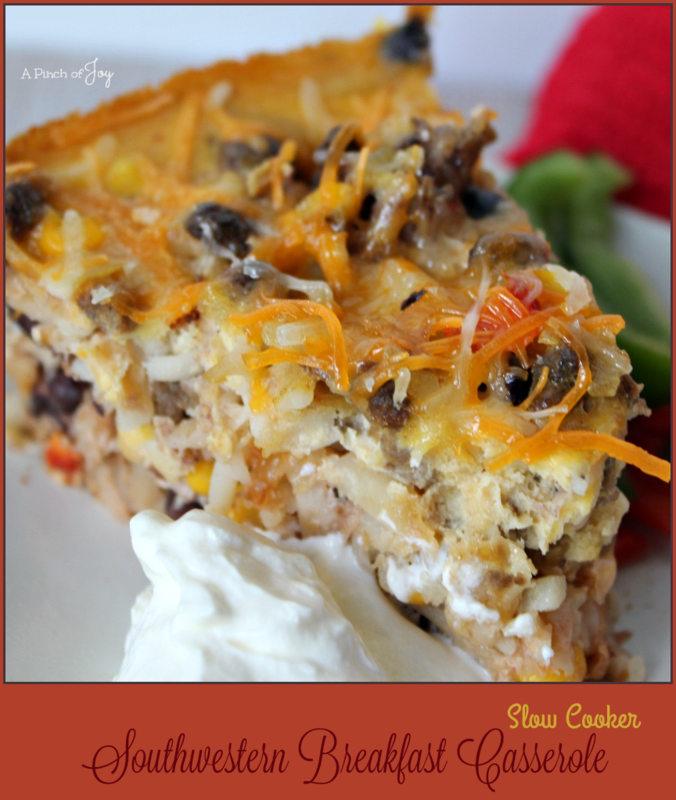 Southwestern Breakfast Casserole made in the slow cooker is a great way to wake up in the morning. It’s yummy enough — and pretty enough — to serve guests even when you’ve stayed up late the night before. I am always up around 3 in the morning so putting it in the crockpot to cook for 3 – 4 hours before breakfast is not a problem. Another alternative is to start it cooking before bed and program the slow cooker to keep it warm after cooking until needed. If you must, put the casserole in the slow cooker insert, cover and put it in the refrigerator, set your phone for the right time to allow for 4 hours cooking. When the alarm sounds slip down to the kitchen, put the insert in the crockpot, turn it on and head back to bed. It’s worth it! You know I am not a spice fan — but if you are, feel free to kick up the spiciness a bit with your favorite seasonings. I used a Mexican style cheese. There are several types and brands — any of them will work, including the ones that have some seasoning added. We’re not salsa fans either, but guests who are think that is a great addition. For us, I serve with sour cream and in this case, strips of red and green peppers. It’s easier to mix the potatoes, sausage, cheese and vegetables in a large bowl, then pour it into the slow cooker insert. The insert is just a bit small for adequate stirring so it is messier. Don’t forget to set aside the cheese for the top. OR you could open a second package of cheese and follow the “more cheese is better” philosophy that Bytes does. (It’s a forgiving recipe!) Pour the whisked together eggs, milk and seasonings evenly over the potato mixture in the slow cooker. Do not sir or you will end up with mush. (how would I know? mmm) Just let the liquid seep into all the cracks and crannies. To create a Make Ahead Freezer Meal, just put the potato mixture in one gallon bag and the whisked egg mixture in another — just that easy. Yummy, filling breakfast with a southwest flair! Make one casserole for breakfast and one to freezer for a later time. Open package of cheese and set aside ½ cup for topping the casserole. In large mixing bowl, combine cheese with black beans, sweet pepper, onion, has browns, corn and sausage crumbles. Spray slow cooker with cooking spray and pour in the hash brown mixture. Whisk eggs in bowl. Add milk and seasonings and whisk again until thoroughly mixed. Pour over the hash brown mixture in crock pot. Cover and cook on low for 3-5 hours. Eggs should be set and the edges golden. Uncover, with paper towel in one hand to catch the condensation so it does not drip. Sprinkle reserved cheese over the top of the casserole. Let set for 15 minutes before serving. Cut into wedges and serve with sour cream and/or salsa or fresh finger vegetables. Pour hash brown mixture into gallon zipper bag and seal. Pour egg mixture into second gallon zipper bag and seal, pushing out air. Put reserved cheese into snack or sandwich sized bag. Put all three bags into another gallon zipper bag and seal, labeling with date, name of dish and cook time. Thaw in refrigerator 8- 12 hours, before cooking to directions above. I love breakfast slow cooker meals and this looks like a real keeper. Thank you for sharing at Saturday Shuffle Blog Hop.